I’ve for some reason only ever had minted lamb burgers. Which are great, but I find you so rarely see any variations when you eat out. Seen as Thursday is now burger day we decided to do something a little different. We had a really rubbish day, first finding out all the nice people that live in our block are moving out because of the incredibly awful men that have moved in upstairs. It’s that bad that the older couple who live downstairs, who own their flat and have spent a lot of money on it thinking they’d spend the rest of their lives there, are selling up and the lovely family that have lived upstairs for 11 years packed up yesterday. We’ve been looking for a while anyway, but this sort of gave us the kick to step up the search and we went to view the most disappointing house ever. Looked great online. Nice location, great price. Then in real life looked like a different house. So, what we really needed was a simple, yet comforting dinner. 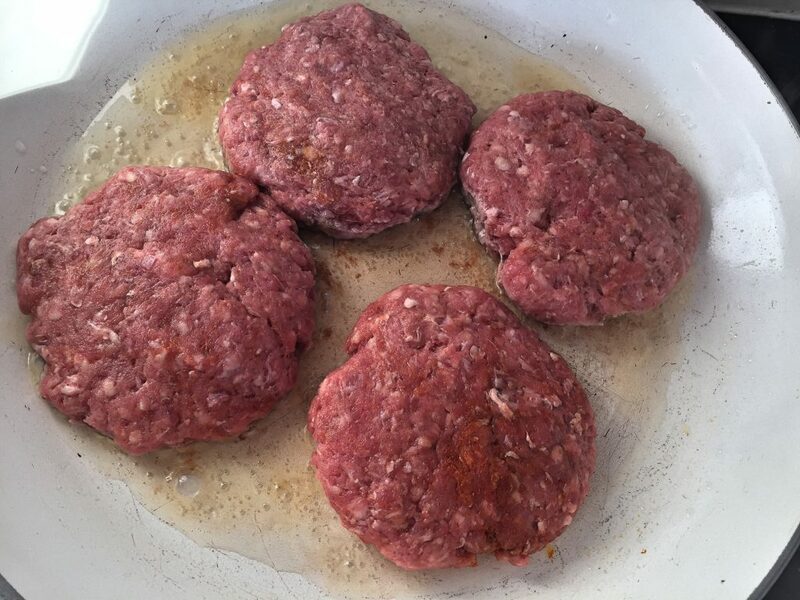 Lamb burgers were a perfect choice. I’m not going to write up the recipe for the rolls. You can find my basic bread roll recipe here. I literally just added 2 tablespoons of rosemary to the dough in the first mixing it all together stage. Everything else is the same. If you don’t want to make your own rolls, store-bought burger rolls would be fine. Really. That’s it. 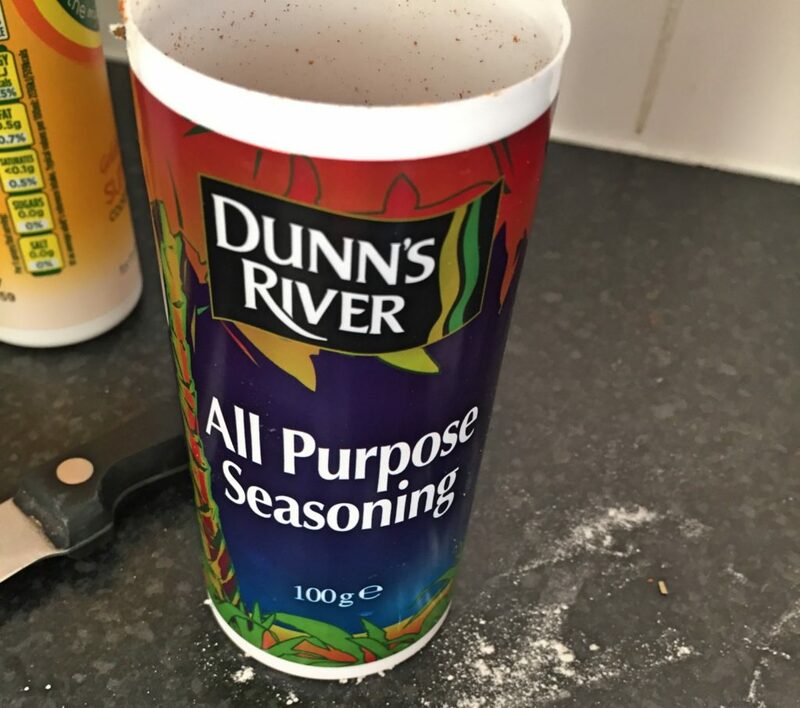 We usually make our own combinations of herbs and spices, but this one tastes amazing, has lots of different flavours and is only 87p. I love lamb, but it can be quite expensive. However, since working with lamb mince, I’ve noticed that because it’s quite expensive, it’s also often reduced so definitely worth checking your supermarket’s reduced shelf. You could always freeze it as soon as you get home if you don’t need it straight away. 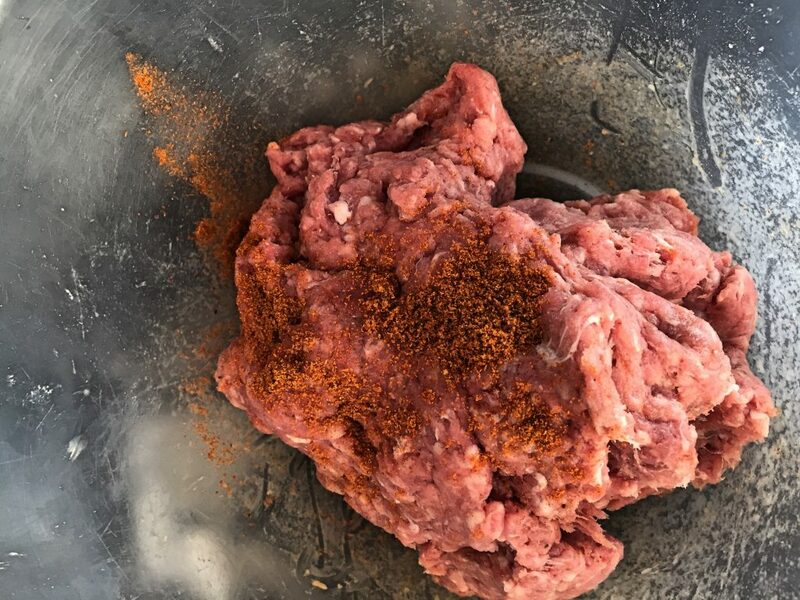 All you need to do it mix the mince and seasoning together in a mixing bowl with your hands. Add a little salt and pepper to taste and warm some oil in a large frying pan. You’re going to shallow fry them, so a good covering of oil is needed. 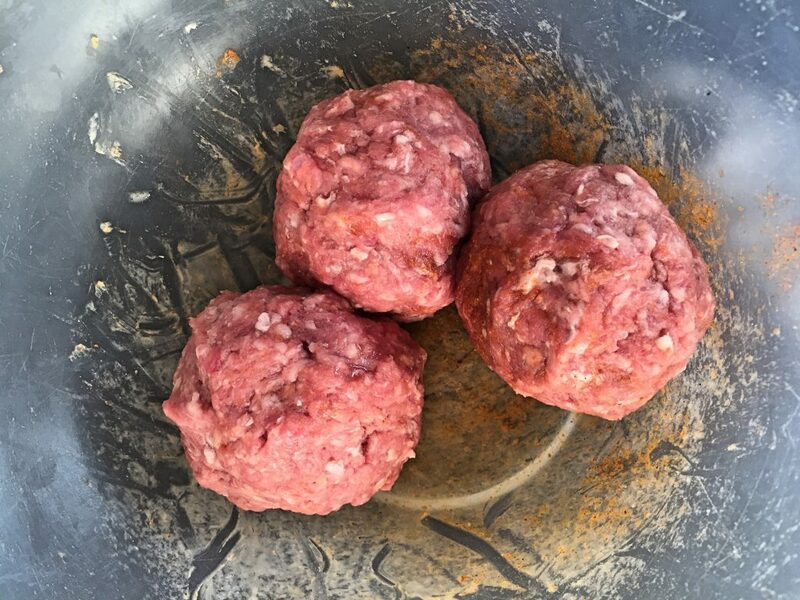 Use your hands to roll the mince into 4 even balls before flattening into patties. Fry gently for 3 minutes on each side while preheating the oven to 180degrees. If you’re like us there will already be chips in there anyway! 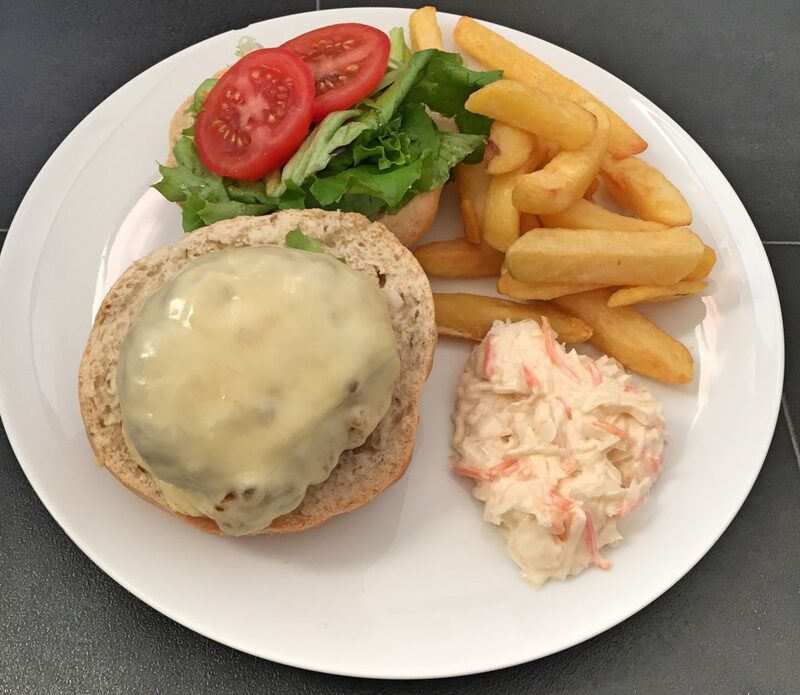 Place the browned burgers on a baking tray, top with a slice of your favourite cheese and bake in the oven for 10 minutes. This melts the cheese beautifully and ensures your burgers are evenly cooked. We went for a slice of Maasdam, which has a mild, almost nutty flavour which worked very well with the lamb and rosemary. Serve lamb burgers on rosemary rolls, with salad and mayo. We also had chips and coleslaw. Because we needed the comfort of fat! Super tasty lamb burgers with cheese.